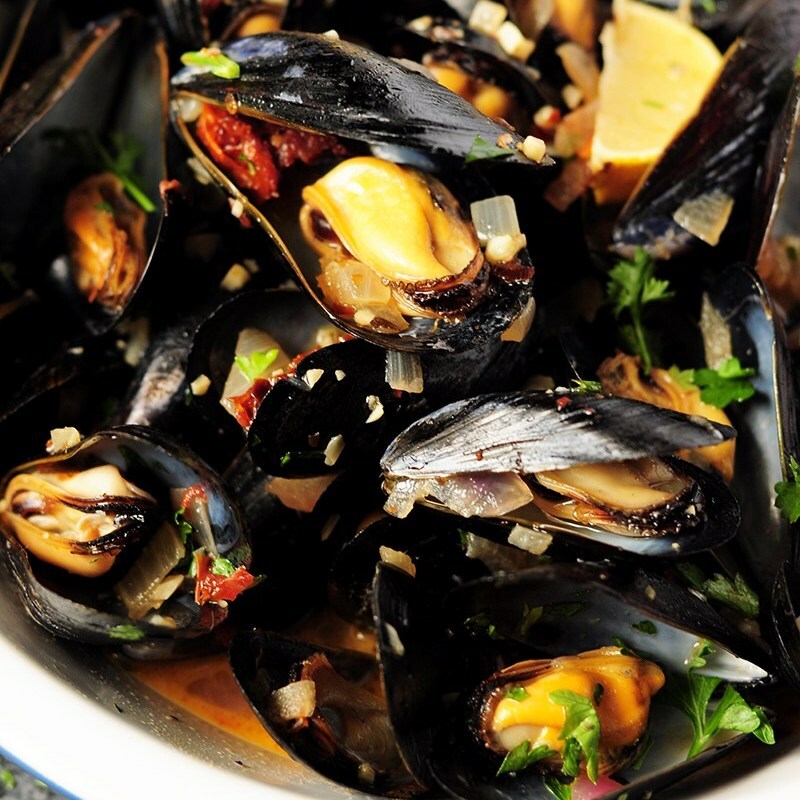 Clean all mussels by rinsing in cold water. Check if your mussels are debearded already. (Farm-raised mussels are usually debearded.) If not, debeard the mussels by removing a group of brown strings coming out of the side of the mussel. 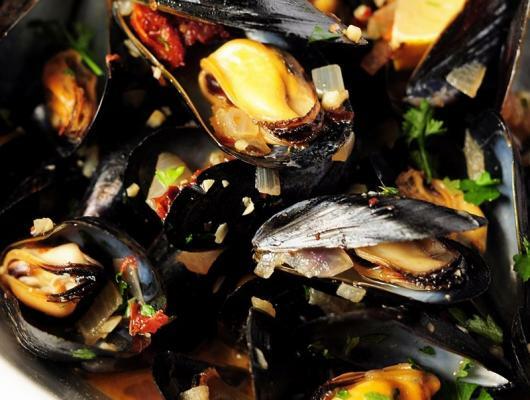 If you see any mussels with their shells open, tap them gently against the countertop. Discard the ones that don’t close. Also, discard the mussels with cracked shells. Melt the butter in a large wide-bottomed skillet or saucepan (with a lid) over medium-high heat. Add the onions, garlic and a pinch of salt. Sauté until translucent, about 2 minutes. Add sun-dried tomatoes, and red pepper flakes, and sauté until fragrant, about 30 seconds. Place all the mussels into the pan and pour white wine and chicken bone broth over the mussels. Immediately cover with the lid and let it cook for 5 minutes. Shake the pan once or twice with the lid on during cooking to distribute the mussels. After 5 minutes, open the lid and check the mussels. Pretty much all of them should be open by now. Discard the ones that are still closed. If you have too many closed ones, put the lid back on and let it cook for an additional 1-2 minutes. Squeeze some lemon juice, garnish with chopped parsley, and serve directly from the pot, Or serve over spaghetti with the mussel sauce. Super easy mussel recipe steamed in white wine and flavor-rich chicken bone broth. Serve it as an amazing appetizer or over spaghetti as an elegant dinner.